Editor’s note: This story is reprinted from pages 24-25 in the August issue of GCU Magazine. To read the digital version of the magazine, click here. Any new ways for students to know what’s happening on campus? 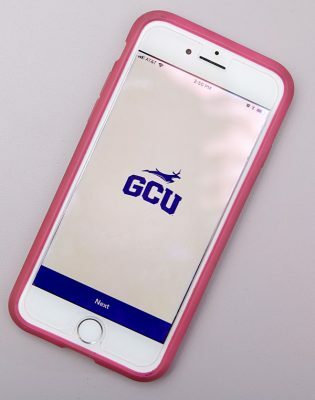 GCU Engage, the new app from Student Engagement, has logins for students, staff and parents and is loaded with information. Its slogan: Keeping Lopes in the Loop. 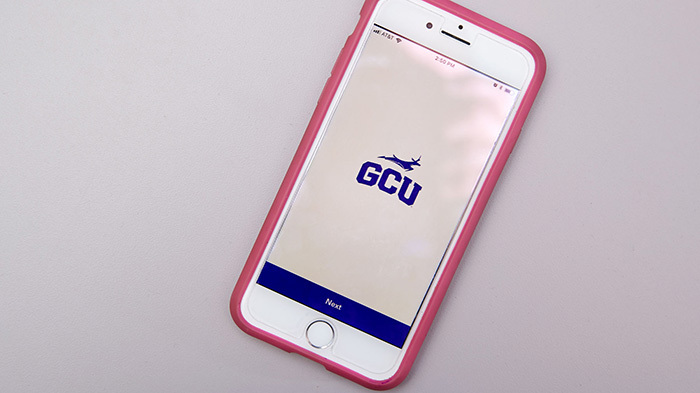 The map provides navigation around campus and the calendar lists Associated Students of Grand Canyon University and Canyon Activities Board activities and events managed by clubs and organizations. Along with personalizing the app to receive alerts from favorite clubs, Bible study groups and intramural teams, students can track their volunteer hours. The app creates a co-curricular transcript, enabling students to show potential employers a record of their community service and leadership experiences. When’s the first play of the Ethington Theatre season? A week earlier than past years. Students arrived on campus in mid- July to start putting together “Ring Round the Moon,” which opens Aug. 24 – the Friday of Welcome Week. The rest of this year’s lineup is “Macbeth” in October, “Peter and the Starcatcher” in November/ December, “Who Will Carry the Word?” in February and “Godspell” in March. What’s the most unusual new club? The Medieval Combat Club enables students to participate in “larping” (Live Action Role Play). There are 126 clubs on campus, and the way this one began is typical – a group of like-minded students started getting together on a regular basis and decided to apply for club status, which was granted in 2017. What can we look forward to at Chapel this fall? The most notable of the six first-time speakers is Joni Eareckson Tada, who has been a quadriplegic since she was injured in a diving accident at age 17. She has written more than 50 books on disability outreach, the goodness of God and the problem of suffering and will be here Sept. 17. Chapel is at 11:15 a.m. Mondays in GCU Arena, and students also can attend The Gathering at 8 p.m. Tuesdays in Antelope Gym. Who are the newcomers to watch on the men’s basketball team? 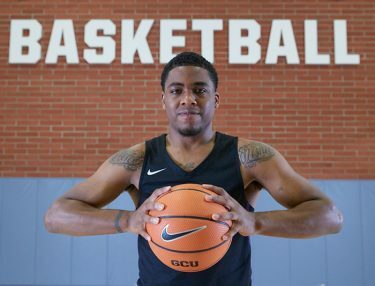 The Lopes have six new scholarship players, two of whom will not play in games until 2019-20 because they are undergraduate transfers (Isiah Brown from Northwestern and Carlos Johnson from Washington). Freshman Tim Finke, the most touted signing, is joined by his brother Michael, an eligible transfer who graduated from Illinois with one year of eligibility remaining. Trey Drechsel is also an eligible senior transfer from Western Washington. J.J. Rhymes, a Phoenix native, might have the largest immediate impact. The Rhymes family is renowned in Phoenix-area high school basketball, and this Rhymes was a junior college All-American at Hutchinson (Kan.) Community College last season. He could start on the wing opposite Oscar Frayer. What’s new on the food scene? The big news, especially for budget-conscious students, is the arrival of Taco Bell. The popular eatery is taking over the top floor of Thunder Alley, and plans are to have it open by the end of September. But that isn’t the only new place. Pita Jungle is taking over the space previously occupied by the Lope Shop on Lopes Way, and Diamondback Apartments on the burgeoning east side of campus will feature Chick-fil-A, GCBC and Fresh Fusion. 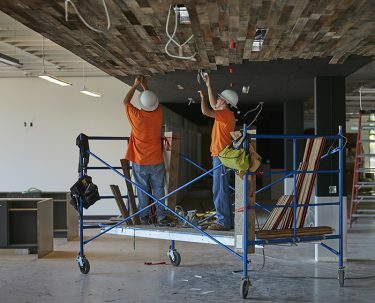 James Strassner and James Staff of 3-G Trim Inc., install a decorative wood ceiling in the new Lope Shop. So where did the Lope Shop go? It moved to the old Fleming Building, just south of Prescott Field, and is going big – it will have 9,500 square feet, five times its previous space, will feature huge new glass display windows, and will tempt shoppers with everything from a Nike concept store to a boutique, a women’s fashion department and a technology area. What else is making the east side burgeon? Five new structures are opening there this fall. The crown jewel is the Colangelo College of Business Building – the first two floors will be ready in August, the other two later in the semester. There’s also the new Canyon Activities Center, which will feature 10 multipurpose courts for students, a new parking garage right next to it on Missouri Avenue, and two new apartment buildings, Cactus and Jerome. Whew, that’s a lot! Any changes in the middle of campus? The College of Nursing and Health Care Professions and the College of Theology switched places over the summer, which gave CONHCP two new labs in what is now the Natural Sciences Building. Theology is looking forward to having a ministry lab in its new digs, and the College of Fine Arts and Production will be able to spread out a little now that it’s in the old CCOB building. There couldn’t be any other big construction projects on the horizon, could there? Silly question. One of the oldest structures on campus, Building 18 (opened in 1984), is scheduled to be demolished during Christmas break and will be replaced by a four-story building that will house Admissions and Student Advisement, a new Antelope Reception Center and student lounges, among other things. There also will be three more apartment buildings going up next to Cactus and Jerome plus a parking garage at 31st Avenue and Camelback Road.